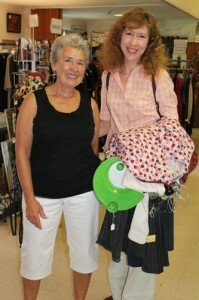 Linda Horton, left, and satisfied shopper Caroline Parker. “I love to shop here because I always find something, and it’s within my budget,” said Caroline Parker of Bedminster, NJ, adding that, “I love the fact that I’m contributing to Matheny.” Parker was one of several shoppers at “First Chance at Second Chance”, the August 22nd one-day reopening of The Friends of Matheny’s Second Chance Shop, a thrift shop adjacent to the Gladstone, NJ, United Methodist Church that raises funds for Matheny. According to Linda Horton, manager of the shop and a member of Matheny’s Board of Trustees, this year’s “First Chance” earned $3,217.79—“the best ever!” Nineteen volunteers helped at the sales counter of the shop, which was restocked and reopened for the 2012-13 season at 9:30 a.m. on Tuesday, September 4. The Friends of Matheny has raised more than $3 million for Matheny since the auxiliary group’s inception in 1983. The 10 a.m. volunteer sales crew. 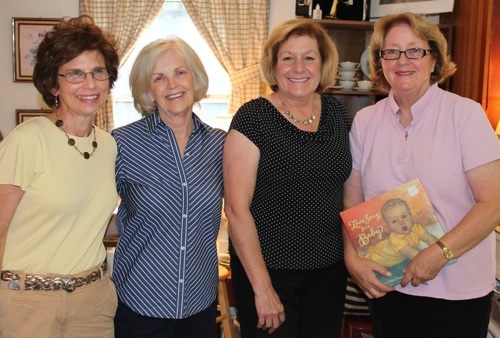 From left: Arlene Rafalko of Gillette, NJ; Marylinn Fox of Harding Twp, NJ; Gloria Radleman of Tewksbury, NJ; and Mary Creamer of Mendham, NJ. This entry was posted in Uncategorized and tagged Second Chance Gift Shop. Bookmark the permalink.